A 1mm-thick, flexible plasma TV could be used just about anywhere. If you thought Sony's 3mm-thick OLED television was impressive, then take a gander at the latest piece of research from Japan - a bendy plasma display that is just 1mm thick. The prototype screen is the brainchild of the inventor of plasma displays, Tsutae Shinoda, and comes from his tiny startup company, Shinoda Plasma Corporation. Unlike Sony's OLED the Shinoda demonstration screen, at 43 inches, is no tiddler. 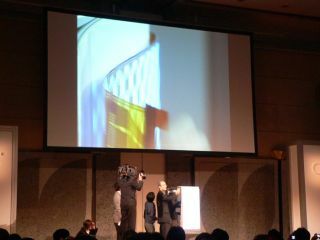 Shinoda explained that the new screen is made of 'plasma tubes' sandwiched between film-like electrodes. The tubes contain the fluorescent gases that emit light when electrically excited. The result is an 800g, 1mm plasma panel that can be flexed even when displaying images, something that opens up applications such as adding the display to odd-shaped areas like inside a tunnel or on the side of a vehicle. Better still, Shinoda explained that the new display need not be manufactured in a factory 'clean room', making it cheap to make if it ever enters mass production.